The Earth's natural "greenhouse effect" is the subject of much controversy among those interested in global warming. Does the greenhouse effect really exist? Does adding carbon dioxide to the atmosphere make the greenhouse effect stronger? 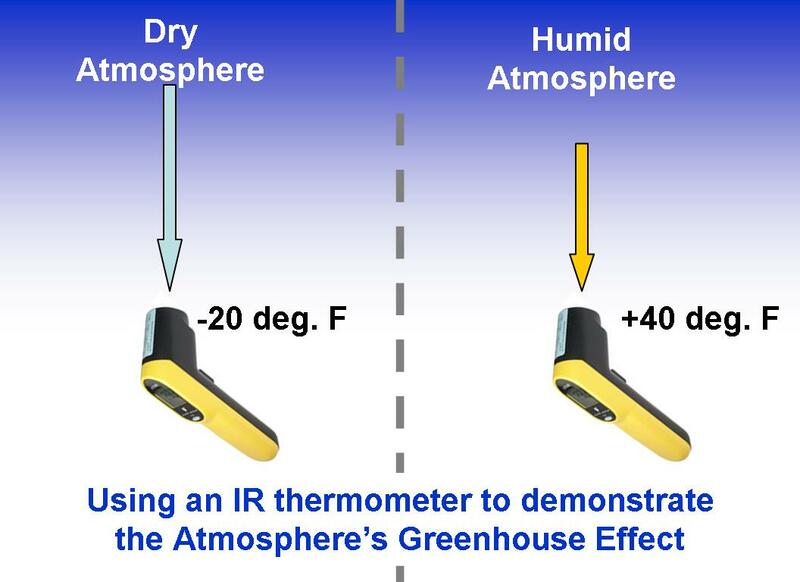 You can perform a simple experiment in your backyard which demonstrates the central claim of greenhouse theory: that infrared ("IR") radiation emitted downward by the atmosphere makes the Earth's surface warmer than if the greenhouse effect did not exist. The experiment uses a handheld infrared thermometer, which can be purchased over the internet for about $50. An infrared thermometer uses an electronic device called a thermocouple to convert tiny temperature differences across the thermocouple into a voltage difference. By thermally isolating the thermocouple, and focusing infrared light onto one side of the thermocouple using a specially designed lens, the instrument measures the intensity of the infrared light coming from any object the thermometer is pointed at, and displays that intensity in terms of an emitting temperature. If the humidity of the air mass is very dry, then the thermometer will typically read temperatures well below 0 deg. F, sometimes below -25 deg. F. If the air is very humid, it will read much warmer temperatures, closer to 30 or 40 deg. F, or even higher. While the average temperature of the overlying airmass also has some effect, the response of the IR thermometer to humidity changes will be found to be much greater than those which air temperature changes can explain. 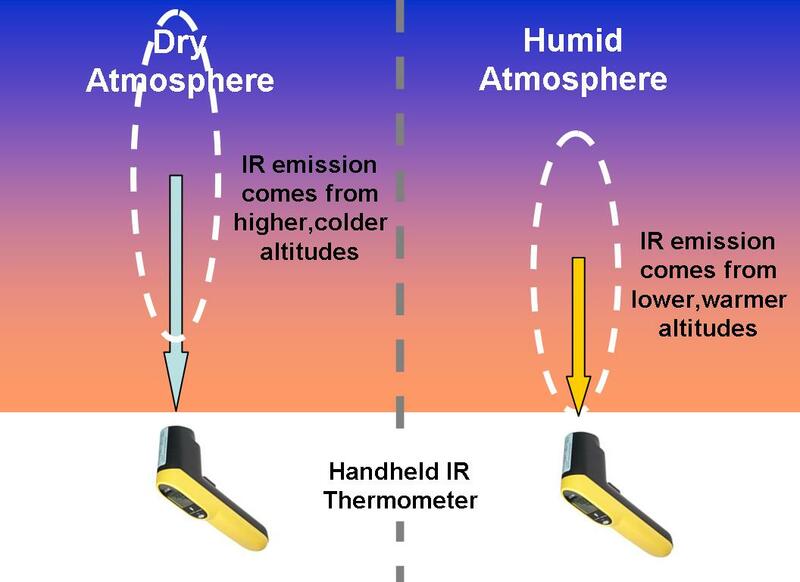 There are two reasons why the more humid airmass gives a higher temperature reading, both of which are from the atmosphere being more opaque (less transparent) to IR radiation: 1) less of cold outer space is seen by the thermometer, and 2) the IR emission comes from a lower altitude in the atmosphere, which is almost always warmer than higher altitudes. If you point the thermometer at a cloud, which is very opaque to the transfer of IR radiation, it will measure the approximate temperature of the cloud. If it is a low altitude cloud, that temperature might approach the air temperature around you, say 65 deg. F for the cloud when the air temperature around you is 75 deg. F. High altitude clouds will register a much colder temperature because they exist at altitudes where the temperature is much colder. SO HOW IS THIS PROOF OF THE GREENHOUSE EFFECT? Greenhouse theory says that downwelling infrared radiation warms the temperature of the Earth's surface above what it would be if greenhouse components of the atmosphere did not exist. The IR thermometer actually measures warming of the sky-viewing side of the thermocouple in response to how strong the downward IR emission is from the sky. Low clouds and high humidity air have the strongest greenhouse effect. A very dry, clear atmosphere has the weakest greenhouse effect. Thus, the IR thermometer measures exactly what greenhouse gas theory predicts: a temperature change (in this case, of the thermocouple) in response to various intensities of downward IR emission from the sky. This is direct evidence of the Earth's greenhouse effect: downward infrared emission by the sky does influence the surface temperature of the Earth. The greater the intensity of that downward emission, the warmer the surface temperature. Finally, you don't have to wait for a change in humidity or for clouds to appear to do this experiment. If the sky is clear, just point the IR thermometer straight up, note the temperaure, then slowly scan down toward the horizon. The indicated temperature will slowly increase because the IR thermometer is seeing more atmosphere, and thus more greenhouse gases, along a slant path than it sees pointing straight up. DOES THE GREENHOUSE EFFECT VIOLATE THE 2ND LAW OF THERMODYNAMICS? Greenhouse warming of the Earth's surface is believed by some people to be physically impossible. They claim it would violate the 2nd Law of Thermodynamics, which basically states that energy must flow from higher temperatures to lower temperatures.